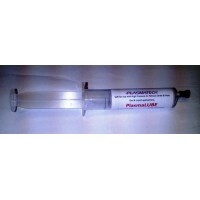 PlasmaLUBE is a high performance,non flammable, oxygen compatible 0-ring grease in an economical and convenient to use syringe with a full 28g (1oz) of lubricant. This provides almost 6 times the volume for just over twice the price of some smaller tubes of similar lubricants!! PlasmaLUBE is a high performance non flammable oxygen compatible o-ring grease, white and odourless,..